1.Congratulations, boss! 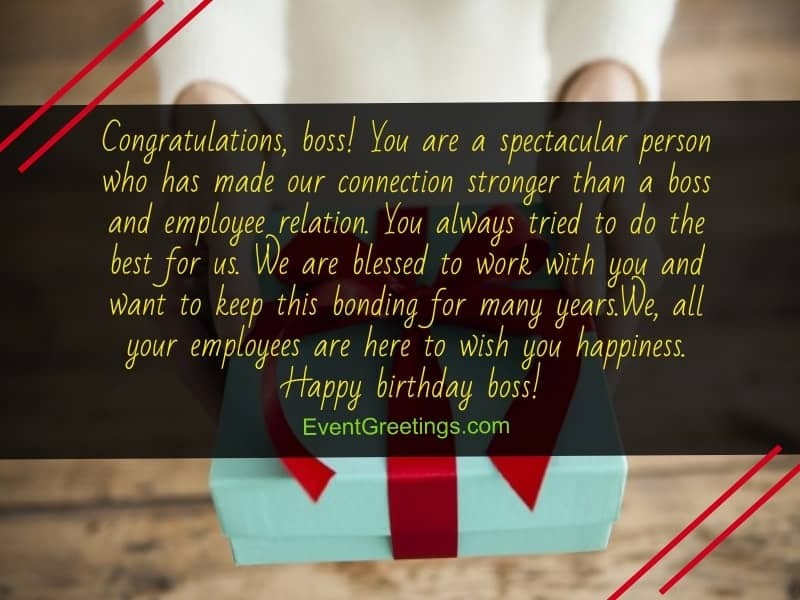 You are a spectacular person who has made our connection stronger than a boss and employee relation. You always tried to do the best for us. We are blessed to work with you and want to keep this bonding for many years.We, all your employees are here to wish you happiness. Happy birthday boss! 2. Philosopher Socrates once said – “Under the guidance of a strong general, there will never be weak soldiers”. For us, you’re a that strong leader who made us capable subordinates. You are an example of determination and courage for everyone. Always be healthy and cheerful. Happy birthday, boss! 3. Today is a special day for the best leader in the world. Happy birthday boss! You are responsible for all our progress and success. Without your help, we never would’ve reached where we are today. We are really lucky to work with you. Enjoy the day and have a blissful life. 4. Today is a very special day not only for you but also for us. Working on a project under your leadership is always a great fun for us. Your friendly behavior always helped us to overcome the difficulties we faced in any task. May all your desires come true! Wish you a very happy birthday, boss! 5.Happy Birthday, dear boss! Today we want you to know that you’re a wonderful boss, friend, and a perfect guide. In every step of work, you have always been there with us like a friend.We love you, sir. You deserve to have the best of everything. 6. Congratulations boss! On your special day, we want to thank you for everything. It is a great satisfaction for us having you in our lead. By following you we feel pleasure not pressure. We have faith in your leadership. 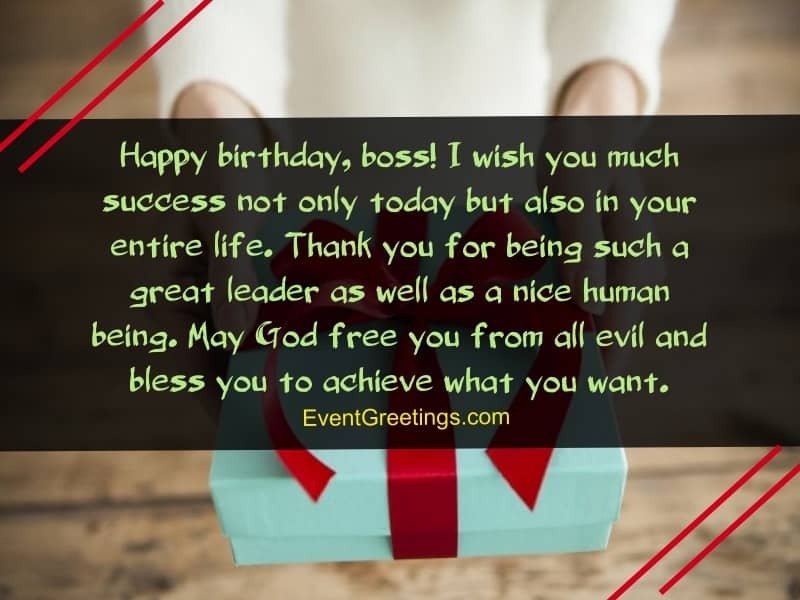 Have a great day boss. Happy Birthday! 7.Happy birthday, Boss! Today is a special day of joy. You are the key to this company’s success. May God keep you happy and healthy so that you can always lead us! 8. Happy birthday boss! You are a very special person to us. Instead of treating as a subordinate, you always treated us as a collaborator. You make a good environment in the workplace and taught us how to work in unity. May God always shower his blessings upon you! 9. The success in any work depends on the dedication, honesty and the guidance. There is no doubt that, we are successful today because of your greatest leadership. You always supported us in our work and also took our opinion. We are really happy to be able to share our working days with you. 10. Happy birthday, dear boss! You are a leader who has created a paradoxical image of arrogance by your friendly behavior. We love you and want to celebrate your every birthday altogether. May all the happiness be constant in your whole life! Enjoy the day full of joy with your loved one. 11. 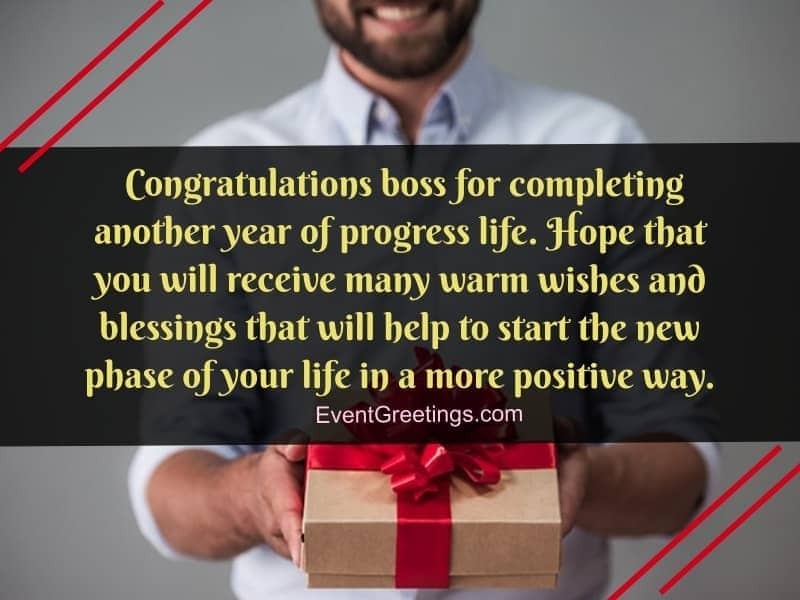 Congratulations boss for completing another year of progress life. Hope that you will receive many warm wishes and blessings that will help to start the new phase of your life in a more positive way. 12. 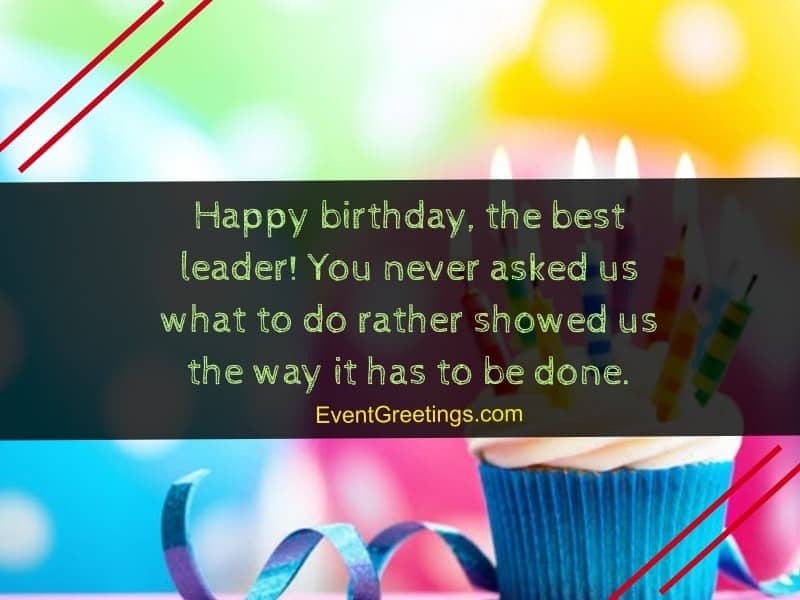 Happy birthday the best boss, colleague and the greatest leader! You are the person who always motivated and inspired us. From you, we learned how to work perfectly even in under pressure. You deserve all the happiness and blessings! 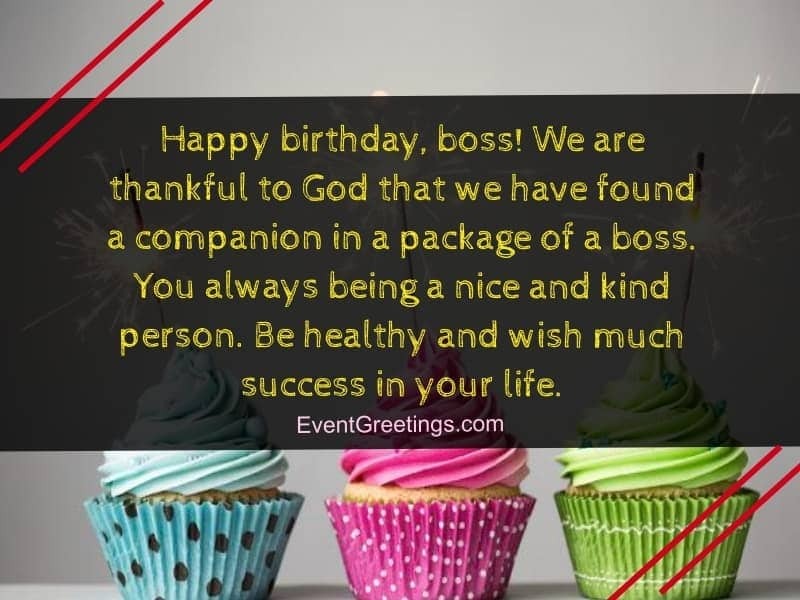 Have a wonderful day boss. 13. The Boss, the friend, happy birthday! In our world, we keep some people in our heart who are very special to us. No doubt boss you are one of them. You lead us to a good path and always encouraged us for the right thing. May God fulfill all your wishes and make you prosper every day! 14. Today, we want you to know that, you’ve always been an inspiration to us. We never saw a person like you who dedicates himself every day to the professional life. Hope that you receive a lot of love and affection and surprises to make an unforgettable memory. Happy birthday! 15. Happy birthday, boss; the pure-hearted man I’ve ever met. May all the lights of your life keeps shinning! Be happy and may God always keep your smiling face. 16. 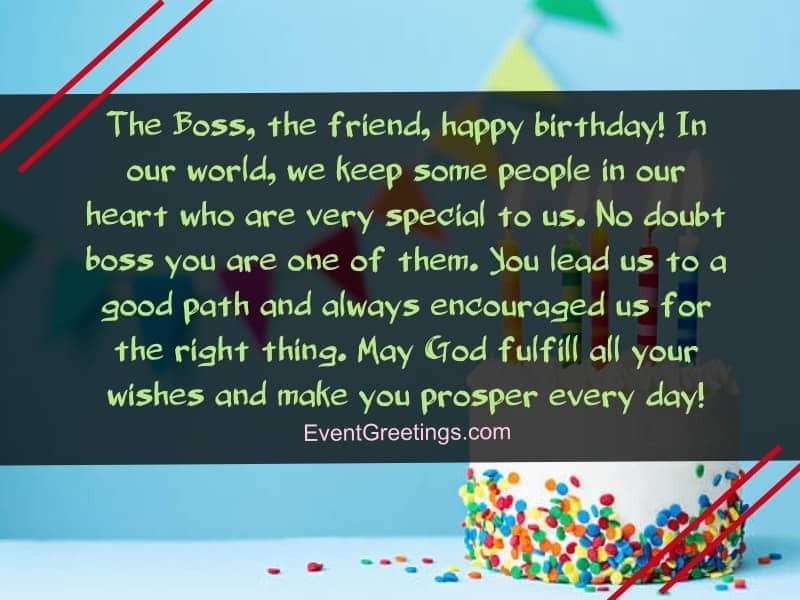 We are here to wish you a very happy birthday boss. You’ve always been a friendly colleague to us. May you always be surrounded by your loved one to make you more strong and happy! Have a nice day boss! 17. Today is a day that cannot be left behind. Happy birthday, boss! From you, we’ve learned that, a boss can also be a good friend. Your guide and support have always been there whenever we needed. Always be like this and celebrate your birthday without worrying about tomorrow. 18. 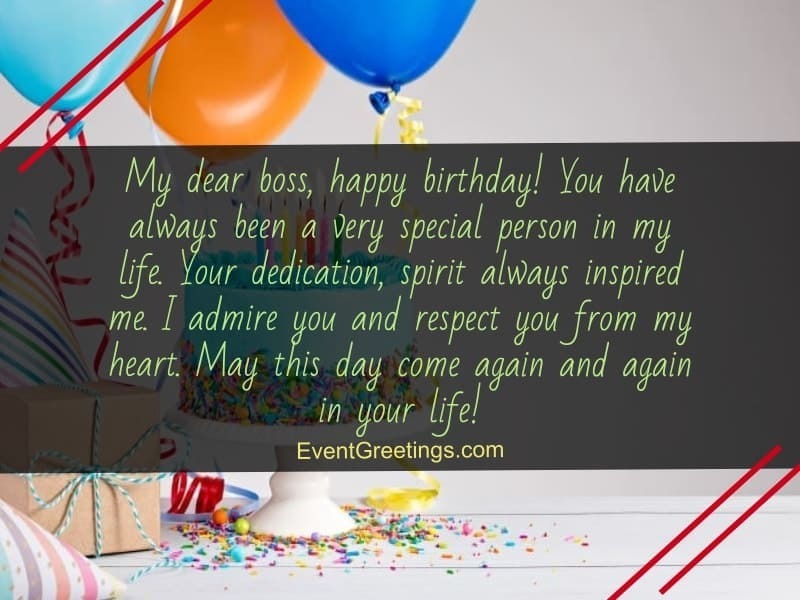 Dear boss, on this special day I want to wish you to have one of the happiest days of your life. Hope that your life always be filled with love and peace. Happy birthday! 19. Happy birthday, boss! We are thankful to God that we have found a companion in a package of a boss. You always being a nice and kind person. Be healthy and wish much success in your life. 20. Happy birthday boss; a person of integrity and professionalism. Thank you for all your teaching, patience and the help. Wish that, every year you get a new reason to celebrate. 21. Congratulations, boss! On this day, I wish you wisdom, joy and peace. I wanted to thank you to give me the opportunity to work with you. Unlike anyone I’m lucky to have a nice boss like you. Have a blissful life. Happy birthday! 22. Happy birthday, boss! I wish you much success not only today but also in your entire life. Thank you for being such a great leader as well as a nice human being. May God free you from all evil and bless you to achieve what you want. 23. I want to wish one of the best people who welcomed me into his team with open arms and always showed me the best way. Happy birthday, boss! I feel so proud to have someone like you as my leader. 24. Congratulations, boss! Today we want you to know that, it’s being a great pleasure working with a determined and sensible person like you. Be happy in every moment of your life. May God enlighten your way forever! 25. In my life, I have deep respect and admiration for some people. And I’m really happy to say that you’re one of them. Really feel proud to work with you. Wish you to have a lot of good moments and many victories. Happy birthday, the great leader! 26. We are here to wish the boss who always values his employees. Know that you are always within us. We wish many joys and a lot of happiness to you and your family. Happy birthday! 27. Congratulations, boss! You’re a great leader to follow and I wish you to lead this company always. Stay blessed. 28. You are the boss who not only shows us the way but also follows the way with us. Everybody is not that lucky to have a leader like you as we are. Many happy returns of the day Boss! Have all the best things in your life. 29. Happy birthday, the best leader! You never asked us what to do rather showed us the way it has to be done. 30.Happy birthday, boss; the constant source of inspiration. Wish you great health filled with happiness and prosperity. 31. Congratulations boss! You’re an example of the strength of will and an inspiration for all the members of our team. You deserve the best and wish you a life of full happiness. 32. 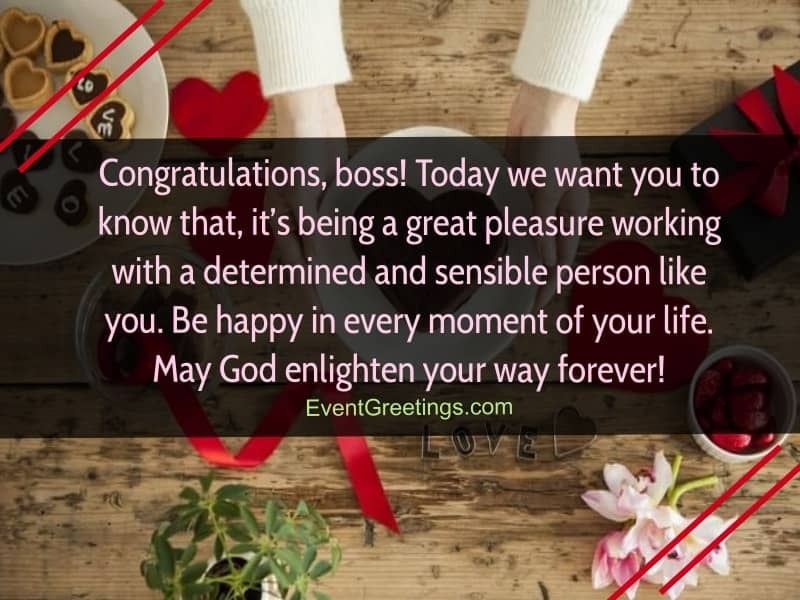 Dear boss, you are like the light of the day who filled us with energy. May you fulfill all your goal! Happy birthday, boss! Love you. 33. 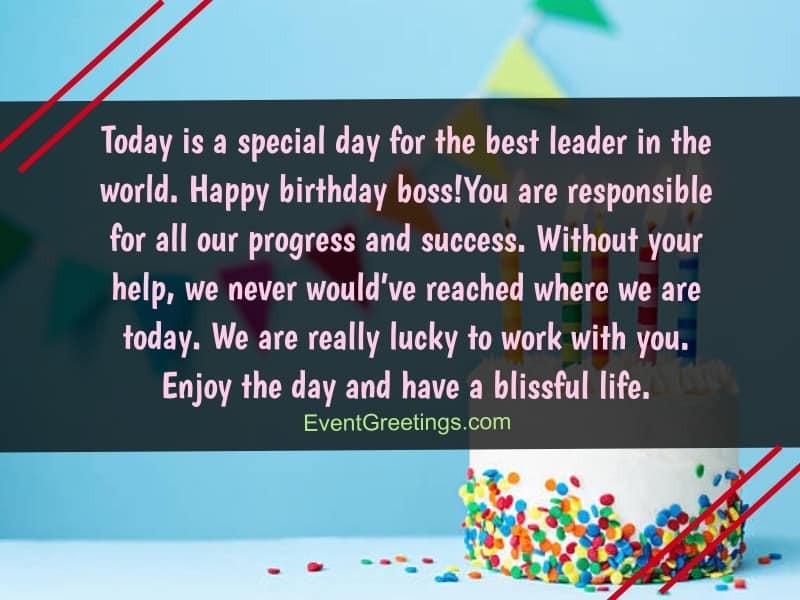 Dear Boss, wish you a very happy birthday! Your perseverance and kindness always inspired us. 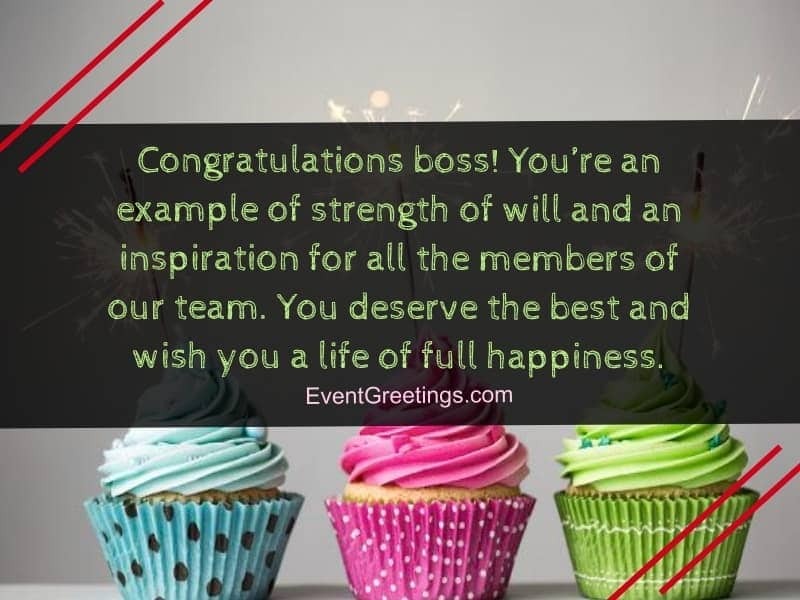 We can hardly express how special you are to our team. Always be happy and healthy. 34. Happy birthday, dear boss! We are happy to share your special day with you. From you, we have learned to see the good side of life. May this New Year brings new dreams and hopes! Your team wishes you great health and many victories. 35. On this precious day, I wish you all the happiness you really desired. May God shower his mercy upon you and give you the courage to eliminate all your sadness. Happy birthday, Boss! 36.Happy birthday to the most admiring & charismatic leader. We consider ourselves lucky to be able to work under your supervision. May God bestow you with growth & prosperity in future! 37. Happy birthday, boss! You are a true leader because you know how to guide us and encourage us. Today is yours so celebrate this day with full of happiness and without stress. Good luck in your life! 38. 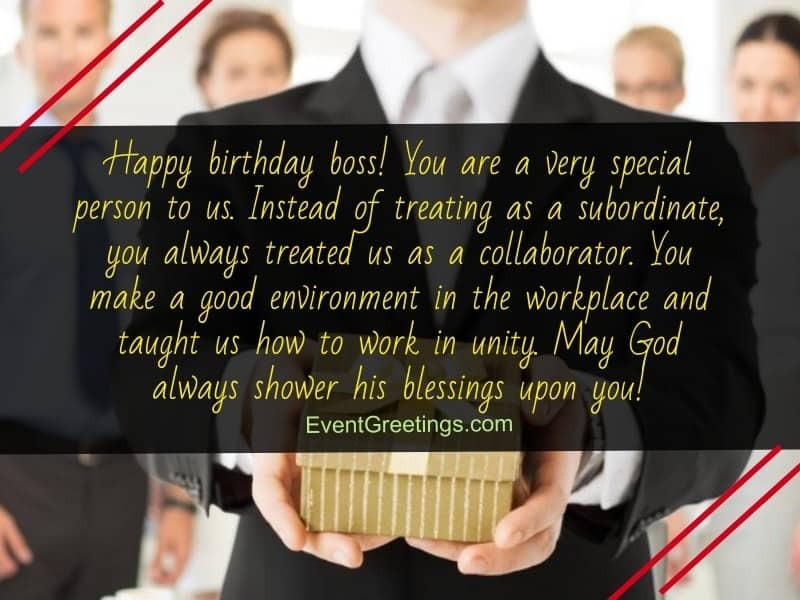 The best boss in the world, happy birthday! You always inspire us and motivate us in every way. A spiritual and pure-hearted leader like you can hardly be found. Wish you to have a wonderful day and a great year ahead. 37. Congratulations boss, a new page of your life has begun today. Happy birthday! We hope that this new page will bring more positive energy into your life. All the best! 40. Dear boss, from you, we’ve learned that a boss can also be a close friend. We always found you in all our need like an angel. Wish you much peace, joy, love, happiness and all the good things that you really deserve! 41. My dear boss, happy birthday! You have always been a very special person in my life. Your dedication, spirit always inspired me. I admire you and respect you from my heart. May this day come again and again in your life! 42. Happy birthday, boss! You always maintain a good relationship with all your employees which is really uncommon in any workplace. We love you, boss! Hope that you will spend a wonderful day and will create a lot of good memories with all the people you love. 43. 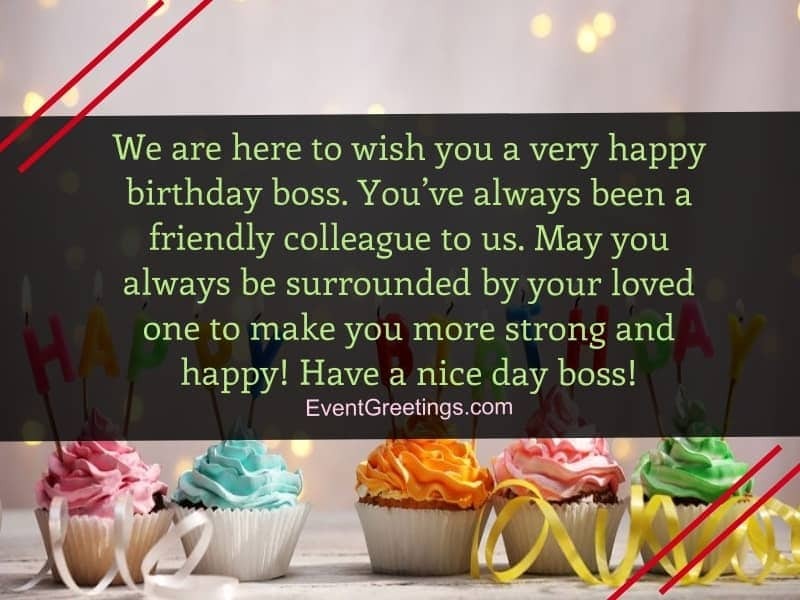 Today is a special day for you and we all of your employees are here to wish you a very happy birthday! May all your desires and prayers be granted! Always keep smiling and be very happy forever. 44. Congratulations boss for completing the half-century of life! Don’t worry about the age, it’s just a number. You’ll always remain the most evergreen person. You have the young spirit which I like the most. Thanks, boss for the friendly behavior during these times and hope to continue it. Best wishes! 45. Happy birthday, boss! You’re smart, intelligent, and also a hard working person. I feel really proud to share my work days with you. May you get much success and have a happy and prosperous life! 46. Today is a great day because it’s the birthday of a very special person in my life. Happy birthday, boss! No doubt, whatever I’m today, it’s because of your help and support. Have an enjoyable day! May God always protect you and keep you safe and happy! 47. 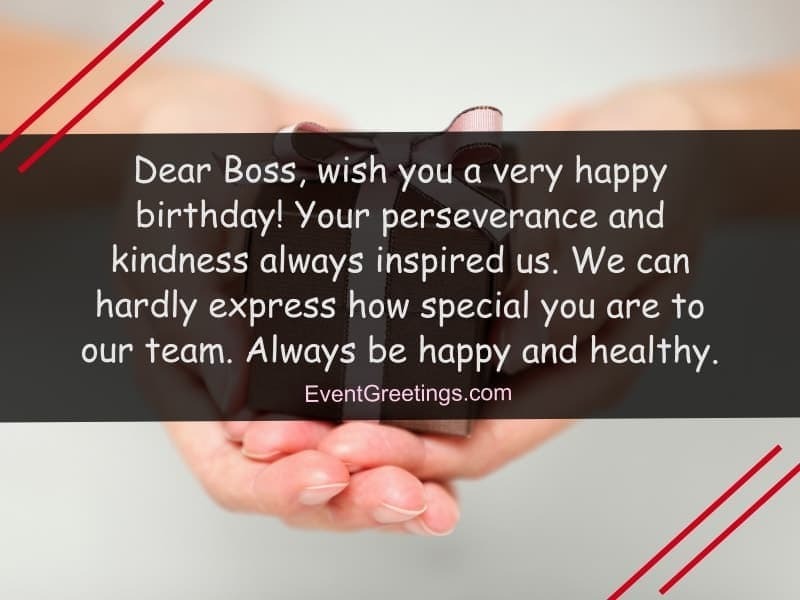 Dear boss, today you’ve turned into 60. Many congratulations to you! After watching your spirit and courage nobody will believe that you are 60 now. You’re still young and fit in every way. May the Almighty grant you with many years of happy and healthy life! 48. Happy birthday, boss! You are a fantastic leader and a great friend. We’ve learned many things from you. You deserve all the best things in your life. Wish you much health, joy, and love! Enjoy a lot! 49. 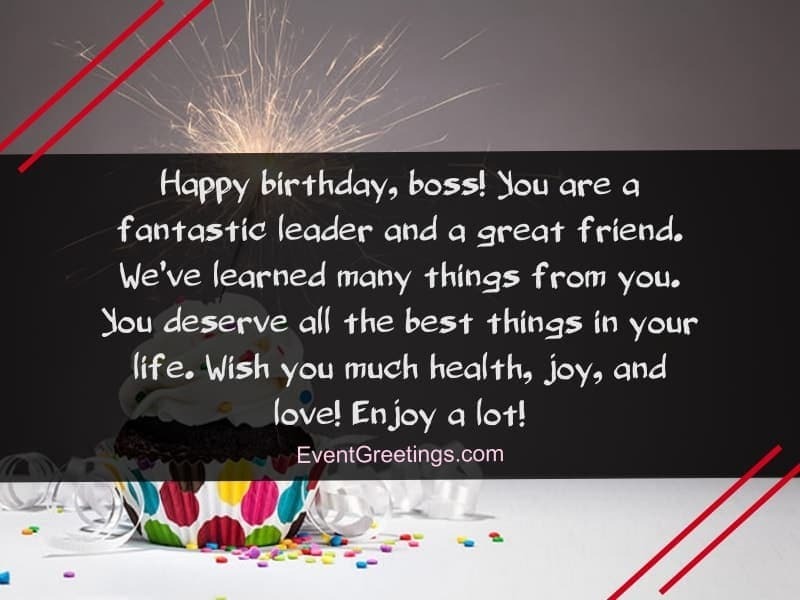 Happy birthday, the most spectacular boss! You’ve taught us to fight for our goal until we get it. Your patience, thinking power, ability, and energy all are admirable. You’re a package with a lot of good qualities. May all your dreams come true! Best wishes for your year of life! 50. We’ve never seen a boss who always remains jolly and cheerful. Today is your day and we’re really happy to be with you. Happy birthday, boss! May you get many good wishes, blessings, and surprises! Have a lot of fun and enjoy every moment of your life. 51.Dear boss, your birth day is as punctual as you. Every year, it comes in the same day and same time. And you can’t deny that we are wishing you at the right time. Happy birthday, boss! 52. 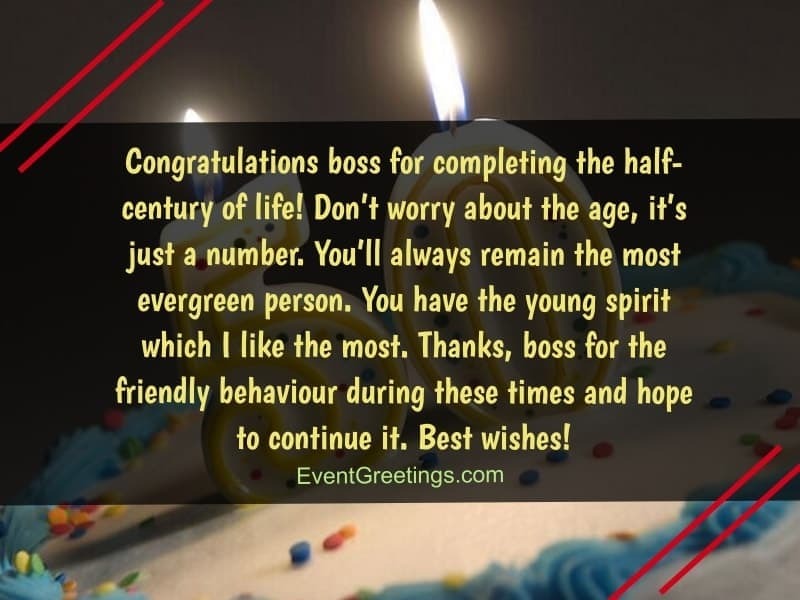 Congratulations boss for promoting to another year of life! We are lucky to have you as our boss. Thanks for all the sacrifices you’ve made to make us the best. Wish you another fantastic year in your both professional and personal life! 53. Dear boss, you are the example for all the mentors. We are so happy and blessed to work with you. Today is a special day not only for you but also for us. Happy birthday, boss! Wish you a long life filled with much happiness! 54. Happy birthday, boss! You are the best boss because you know how to manage the team and understand your employees. You are my inspiration and I follow your footsteps. With all my heart, I wish you to have a healthy and peaceful life! 55. Dear boss, you never underestimate your employees and always inspire us. 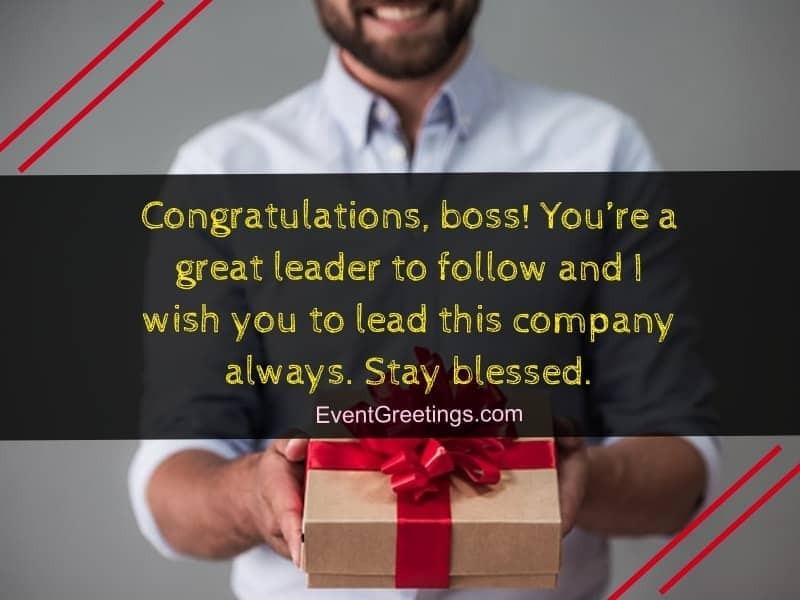 You are the perfect boss to be followed. Really, we owe you a lot. May you never lack of love and happiness! Happy birthday! 56. Today is a great day and boss, we want you to know that we are really grateful to you for your guidance, advice, and help. You truly deserve the warm wishes on your every day of life. 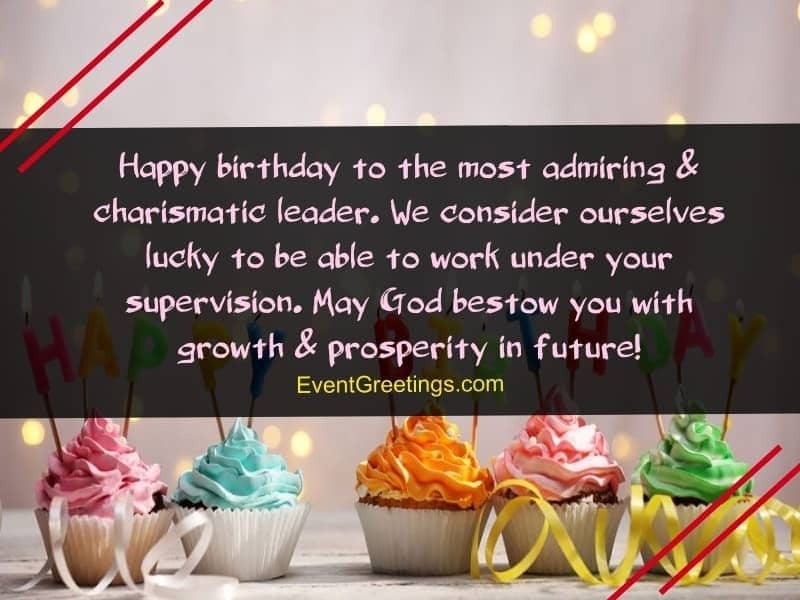 Wish you a very happy and enjoyable birthday! May this day come again and again in your life! 57. 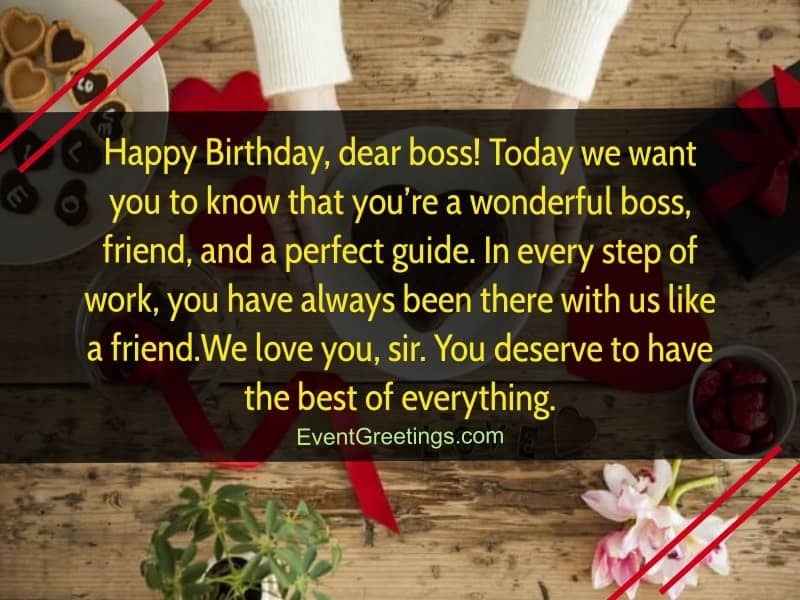 Happy birthday to the best boss of the world! You are kind, humble, supportive and the best model we could look for. Thanks for being such a great mentor. Wish only the best things happen in your life! 58. It’s time to celebrate the birthday of a great person. Happy birthday, boss! Thanks for the encouragement, motivation, inspiration and the support. We wish, this new year of your life brings loads of success and glory. Love you, boss! 59. Today is your birthday and I’m here to wish you a wonderful and stress free life! Many congratulations, boss! I hope you won’t be as much “GRUMPY” as you always are. 60. Happy birthday, boss! No Matter how older you become, you will always remain the same for us. You always inspire us with your hard work, professional attitude and helping mentality. Because of you, we have come a long way. May you continue your successful journey of life! Good luck!